In two seasons at Memphis after transferring from Santa Monica College, Bruce caught 113 passes for 1586 yards (14.0 avg.) and 15 touchdowns, including 74 for 1054 yards and 10 TDs in 1993. He was chosen by the Rams in the second round of the ’94 NFL draft and had a quiet rookie season, with 21 catches for 272 yards and three touchdowns, before missing the last four games with a knee injury. Bruce broke out in 1995 by catching 119 passes for 1781 yards and 13 TDs, showing off his deceptive speed. Rams went 6-10 to finish third in the NFC West. Bruce was slowed by injuries in 1997 and ’98, appearing in a combined 17 games with diminished production. Healthy again in 1999, and with an improved supporting cast that included QB Kurt Warner and WR Torry Holt, he had the first of three straight Pro Bowl seasons, scoring 12 touchdowns among his 77 receptions for 1165 yards in ’99, pulling in 87 passes for 1471 yards and 9 TDs in 2000, and averaging a career-high 17.3 yards on 64 catches for 1106 yards in 2001. Bruce stayed with the Rams until 2007, compiling a total of eight thousand-yard seasons and leaving the club as the career leader in pass receptions (942), receiving yards (14,109), and TD receptions (84). He finished up with San Francisco in 2008 and ’09, giving him overall totals of 1024 catches for 15,208 yards, which ranked second all-time in NFL history, as well as 91 TDs. Bruce added another 44 receptions for 759 yards and four touchdowns in the postseason, all with the Rams. 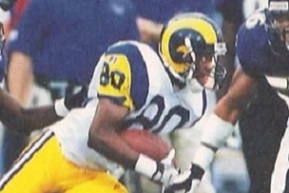 He was a four-time Pro Bowl selection and the Rams retired his #80.